Going to Japan is wonderful- nothing could be more exciting than visiting the country of cherry blossom, anime and sushi. Japan is full of things to do, and will cater to many different people! For the foodies, you have a nation which lives off the most delicious food in the world, with natural flavours enhanced with carefully chosen seasonings. For the gamers, you have the nation that brought you classics like the Mario universe. For the party-goers, you have fabulous nightlife and modern karaoke and famously good sake! Japan is most known for its wonderful temples, castles and old traditions, so a trip here will definitely leave you more knowledgable than when you arrived. However, the trip and the stay will be exhausting if you do not find out some basic information beforehand to help you have a stress-free trip. Here are a few key pieces of information that I found particularly useful on my first trip to Japan. Japan’s most popular mode of transport around the country is the system of trains, and in particular, the Shinkansen. Shinkansen are fast speed trains that go from almost all main towns and cities. They are a great way to visit a couple of different places in a short amount of time, since the journeys are much shorter than the usual trains, and the Shinkansen are not particularly expensive either, although there are certainly much cheaper ways to get around by standard trains too. The most effective way of getting around Japan for tourists is by using the Japan Rail Pass, which is available to buy from specific travel agencies. The most popular agency in the UK would be the Japan Travel Centre in Holborn, London. They provide help with traveling to Japan, and also list recommended hotels and ryokans in Japan. For a two week pass, the adult cost is 255 pounds for unlimited use on railways and the high speed bullet trains and some buses. The centre also offers passes for one-week and three-week periods. 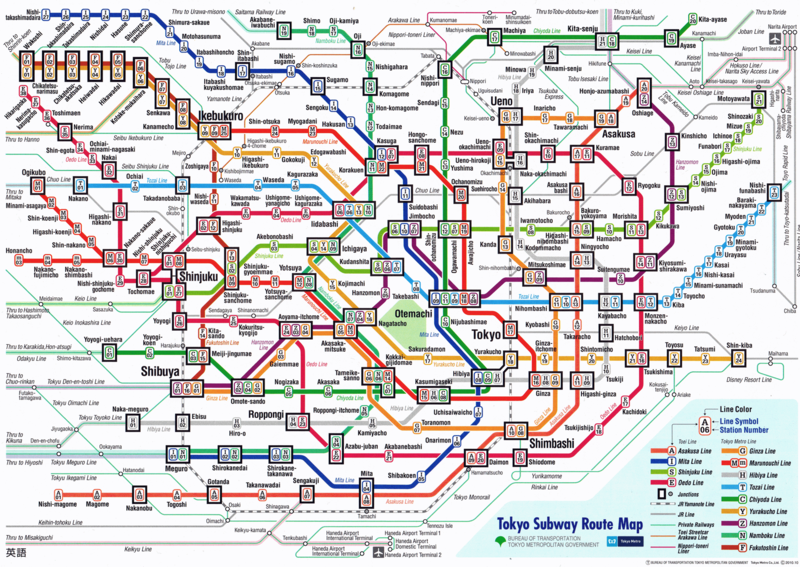 All of the most popular cities (Tokyo, Kyoto, Osaka, Hiroshima, Fukuoka, Kobe, Nagoya, Sapporo, Sendai, Yokohama) have metro systems which you can find maps of online to help you get around. I will show three of the most popular metro maps here as a guide to see the prices located for each stop. When you are at a train station, it is as simple as finding where you want to go, and looking for the price above the name. The most common fees are 170 yen, 200 yen, 240 yen, 280 yen and 310 yen. 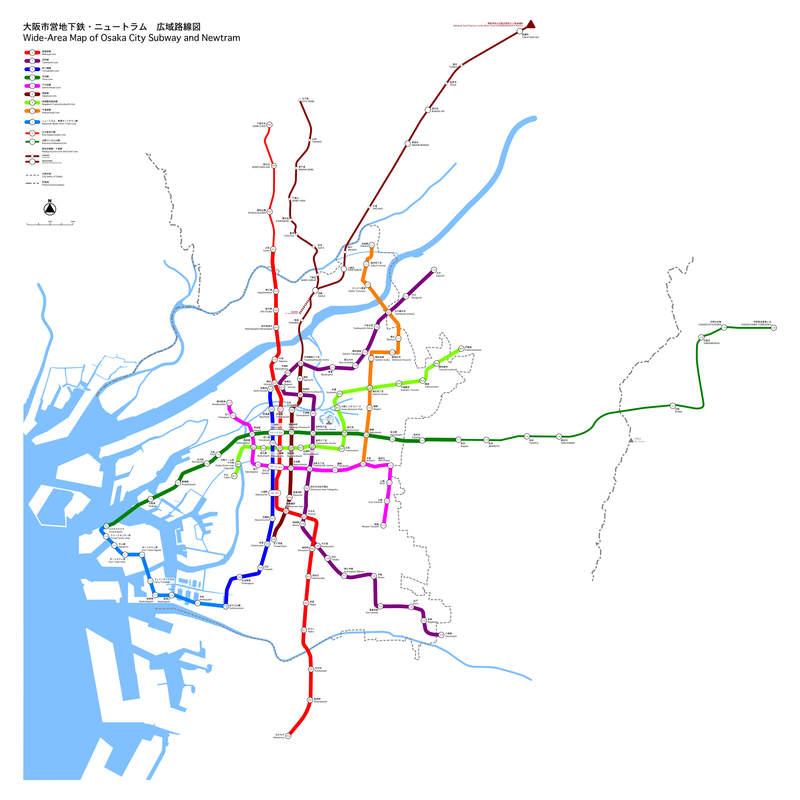 The Tokyo Metro site is very detailed and provides you with the exact information you need to get from A to B as well as giving you ticket prices, discounts and how to use the different tickets. It also lists the most popular attractions in Tokyo and how to get there! They do also provide a very useful app for iOS and Android devices that works offline to direct you on your journey. It is available in English, Chinese, Korean and Japanese. I would recommend getting it, as it can sometimes be troublesome to carry a map around! Download here as a pdf. document for easy printing. Although the Kyoto Metro website is far less detailed, it does still provide valuable information about travel in Kyoto, as well as some of their more well-known festivals and famous shrines. 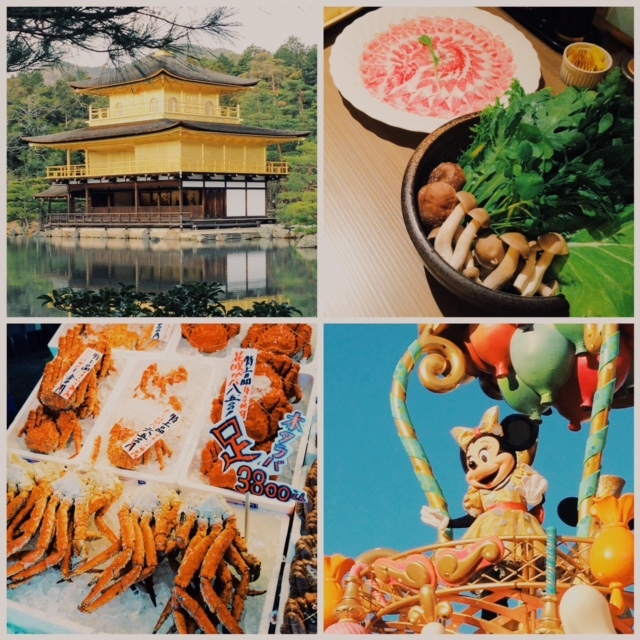 I would also recommend the Kyoto travel guide given by Tripadvisor on the most exciting things to do in Kyoto and how to plan your stay there. 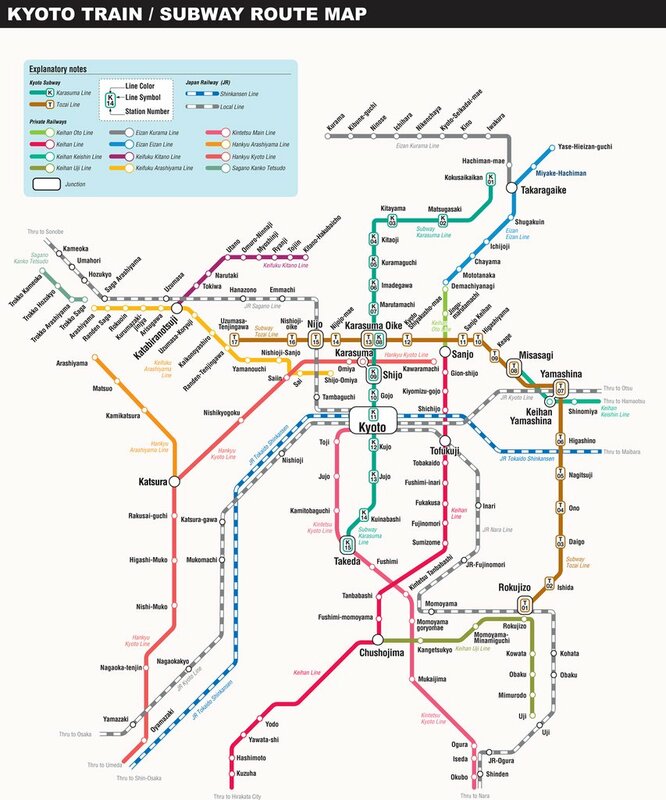 The Osaka subway website is also not extensive, however it does give you information as to how to get the correct fare on the metro and also how to use the bus system in Osaka. It does provide special passes for tourists and a couple of links at the bottom of the page to the tourist attractions. 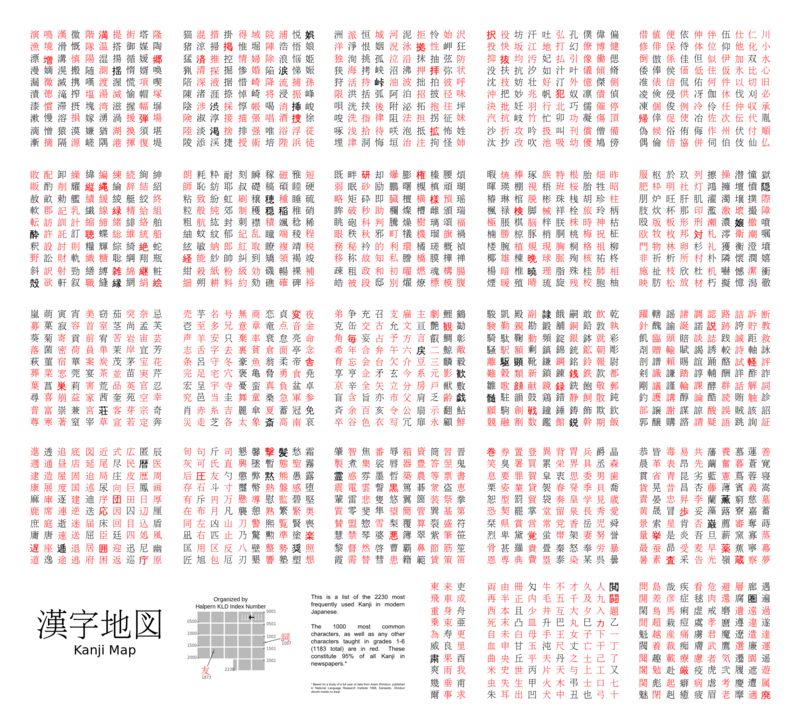 The kanji above are the 1000 most common characters that appear in the Japanese language. Barely rippling the surface, it already seems like a lot to take in for a foreigner. Thankfully, tourists definitely do not need to learn anything near this. It is useful to recognize the most simple signs so as to remember the name of a temple or a particular restaurant by sight, however it is not necessary for simply going to Japan, since a lot of the signs for tourist destinations are written in English, and listening guides in English and other languages are available at the museums and some of the famous sights around Japan. If, however, you do want to delve into Japanese culture a bit more, a more thorough understanding of Japanese (enough to converse) would be recommended, unless you have a Japanese friend who will gladly show you the ropes and let you come closer to the culture’s core. Many books, websites and apps offer basic Japanese for tourists and those slightly above beginner level, letting you delve into the language through listening, repetition and writing. I would recommend the Japanese Lessons, available online for a quick familiarization with the most used phrases. I would also recommend checking out the channels on YouTube for Gaijins (foreigners) who teach English in Japan and are learning Japanese themselves, as they often post quick ways to learn Japanese. My favourite is Abroad in Japan, by Chris Broad, who documents his efforts studying Japanese as well as various fun locations and sights around Japan. It would also be useful to get to know as much information as you can before you see a particular temple to familiarize yourself with its history. The same would go for food- if you do want to try one of the 267 Michelin-starred restaurants in Japan, it would be worth getting to grips with new ingredients and dishes. A particularly useful guide for me as a foodie was ‘Japanese Food-A Simple Art‘ by Shizuo Tsuji. It takes you through an encyclopedia of Japanese ingredients, commenting on the origins, best cooking methods and peak seasons throughout the year. Other, shorter books may be less comprehensive, and this heavy volume goes into exhaustive detail on almost every aspect of Japanese cooking. Here the rules do get slightly trickier- certain Japanese customs might be quite different from ones in the West. Essential customs deal with politeness and respect- foreigners can sometimes be seen as loud and obtrusive next to the locals. There are a few rules listed here that I think are essential for getting around Japan unobtrusively, but keep in mind that some places may have their own rules and you should definitely ask beforehand if there is anything you need to do beforehand. In Japan, most tourists are usually quite respectful, however slip ups in more serene places, such as during a tea ceremony or in a temple may not be seen well! Please do use this list as a guide, and try to adjust to local customs where you can. Take off your shoes if you go inside a building, especially if it has tatami mats on the floor. Use ‘sumimasen‘ (excuse me) if you are in a crowded area and are trying to get past, and try not to use your elbows. The only time I have seen crowds get unruly in Japan is at Disneyland or during peak holiday times or when there is a sale on! If you are making a visit to a sushi shop follow the etiquette: use the hand towels provided to clean your hands before the meal, do not mix wasabi into your soy sauce as they are meant to be separate flavours, dip the fish side of the nigiri in the soy sauce, not the rice, and use gari (pickled ginger) to cleanse your palette between pieces. In the majority of sushi shops you can use your hands to eat the sushi, just please use the hand towel beforehand! Follow temple etiquette: bow before entering through the tori gates, only draw one omikuji (temple prediction) per year (its considered bad luck and greedy to draw more) so pick your temple wisely!, lightly toss the coins into the box in front of the altar, avoid bringing selfie sticks as most places in Japan have now banned them. In large department stores, do not push and try to get out of the shop assistant’s way as it is always really busy there! Stand in the guided lines on the platform to wait for the train and if you are carrying luggage, place it so that it does not get in the way for people getting out. During rush hour, be prepared for a bit of a squeeze on the trains as they do get very packed! Otherwise, enjoy your stay in Japan and have fun exploring everything it has to offer! Please do let me know if there is anything in particular that you need help with, and I will do my best with any question!